Send big teddy bear love for any holiday, achievement or occasion, with personalized giant teddy bear gifts delivered to their door. Select Free Shipping at checkout on the Giant Teddy website. Shop by Color - When it comes to huggable gifts, the folks at Giant Teddy believe that bigger is always better, featuring a beary special selection of cuddly critters that are sure to please friends, family members and loved ones of all ages. Send a snuggly sentiment in their favorite hue with a giant teddy bear in basic white, cream, brown or black, plus girlie pink and bright red teddies, green, grey, blue or purple plush pals that are utterly adorable. Shop by Size - Some bears are too big, others are too small. Find one with a height that is just right with three different sizes including small, medium, large and lovable options to choose from. You'll find lightweight, oh so cute Club size, middle of the road Tyke size, and jumbo My Size Bears that are over 55 inches in height! Shop by Holiday - Whether you're celebrating the new Grad, your beloved Valentine, or Mama Bear on Mother's Day, you'll be sure to find the perfect stuffed teddy bears and sidekicks to shower any and every recipient on your gift list. Commemorate any holiday or occasion on your calendar with green teddies for St. Paddy's Day, cap and tassel topped graduation bears, and a variety of festive and merry holiday chums that your cherished ones will love finding under their tree on Christmas morning. Shop by Family - No two teddies are all alike. Shop your favorite big teddy bear families to find the perfect bosom buddy that will warm any gift recipient's heart. Choose your favorite collection of fine-furry friends, with pleasantly plump Chubs to checkered bow Cuddles, toggle heart scarved Hugs to tubby bellied Tubs, Shags, and Big Love bears branded by their matching birthmarks on their noses and left paws. 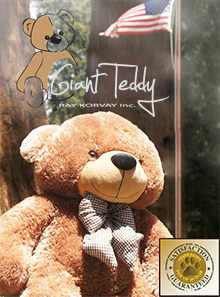 For the past 14 years, Giant Teddy has specialized in providing a snuggable collection of well-constructed, stuffed teddy bears for little ones, boyfriends, girlfriends, and stuffed animal enthusiasts of all ages.